Hunt down Ancient Egyptian Treasures and play Sands of Fortune Slots game at Vegas Spins! Spin past Egyptian pyramids, fiery scorpions, the Eye of Ra, to FREE spins bonuses and jackpot prizes and multiplies prizes! 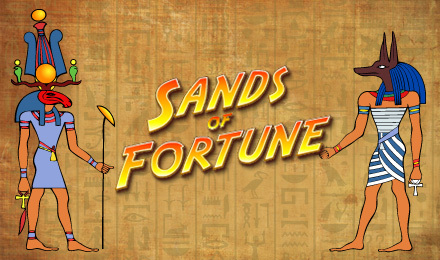 Search for Ancient Egyptian Treasures at Sands of Fortune Slots game at Vegas Spins! This 5 reel awesomely ancient game features Egyptian pyramids, scorpions, the Eye of Ra, FREE spins, bonuses and jackpot symbols which can multiply your stakes by 25!